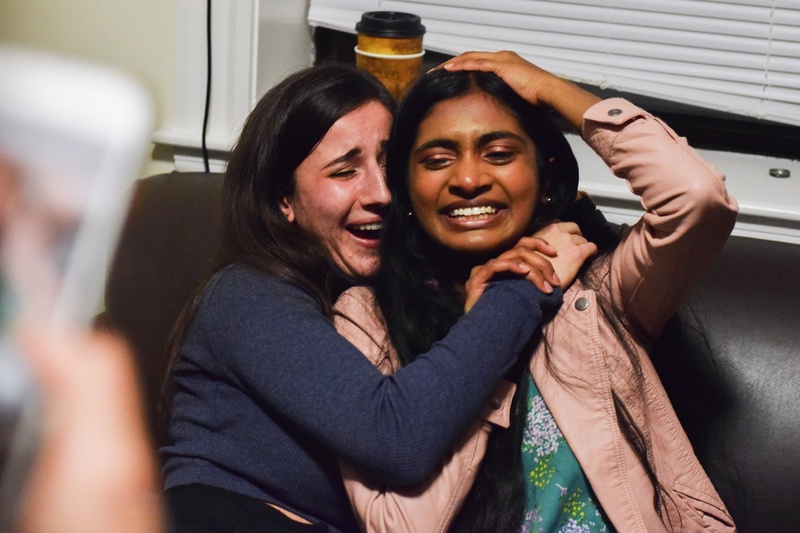 Sruthi Palaniappan ’20 (right) and Julia M. Huesa ’20 (left) collapse onto a couch after hearing that they won the Undergraduate Council presidential election. Sruthi Palaniappan ’20 and Julia M. Huesa ’20 will lead the student body as Undergraduate Council president and vice president in 2019, the UC Election Commission announced Thursday evening. 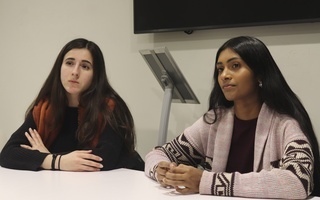 The duo garnered roughly 41.5 percent of the vote total, easily beating out second-place finishers Nadine M. Khoury ’20 and Arnav Agrawal ’20, who received 26.6 percent of the vote, according to an email sent by the commission to College students. Daniel K. Ragheb ’20 and Samyra C. Miller ’21 finished in third with 20.6 percent of the vote, followed by John T. Ball ’20 and Sabrina Wu ’20, who dropped out of the race last week but remained on the ballot. "It's so surreal,” Palaniappan said in an interview Thursday evening, surrounded by fellow students who worked on her campaign. Huesa said the results left her unable to fully articulate her feelings. The duo proposed offering funding for some undergraduate social events and called for the creation of cultural climate committees across all academic departments to bolster Harvard's capacity to address sexual assault allegations. The Government department created a committee earlier this year to evaluate departmental culture in the wake of allegations of sexual misconduct against Government professor Jorge I. Dominguez. This year’s election saw significantly increased turnout from the 2017 race, with 2,797 students casting ballots. That figure represents a roughly 35 percent increase from last year’s turnout. 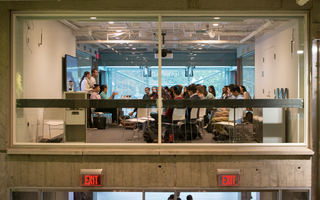 Earlier this semester, the Council changed its voting method to a Borda vote count, a ranked-choice method in which each candidate receives a quantity of points corresponding to their ranking on the ballot — first-choice tickets received one point, second-choice tickets received 0.5 points, and third-choice tickets received 0.33 points. Olivia K. Bryant ’21, a member of the Harvard Open Data Project, which polled students about the race last week, said in a Wednesday interview that the new voting method could potentially lead some undergraduates to vote in a more strategic manner. But given the margin of victory for Palaniappan and Huesa, the voting system likely did not change the election’s outcome. This year’s winners are both longtime members of the UC. Palaniappan, the Council’s education committee chair, has organized student town halls about proposed changes to shopping week and spearheaded legislation to fund faculty-student dinners. Huesa, who serves as vice chair of the Council’s Student Relations Committee, has participated in efforts to establish a multicultural center on campus. Palaniappan said she and Huesa plan to work on improving the Council’s communication with the student body in their first days in office. Huesa said she hopes to increase the diversity of the UC, a push that she noted would need to begin shortly, given the Council’s spring elections occur in mid-February. “I think recruitment for midterm elections will also be really important because there's a lot of underrepresented communities on the Council so far and people just generally don't know what they can do on the Council,” she said. Huesa added that she would work to ensure that the Council’s identity caucuses are fully “instituted” by the beginning of next semester. Zhang said in an interview Thursday that she is “excited” for Palaniappan and Huesa to begin their term. Boucher agreed, saying he was eager to see what the duo would accomplish during their tenure. “I think they’re an exceptionally deserving ticket, and I cannot wait to see what they will do over the coming months,” he said. Ragheb and Miller’s loss represents the 22nd time in the past 23 UC elections that outsiders have fallen to tickets with previous UC experience. Voters also weighed in on two referenda in this week’s election, after the Council decided to place them on the ballot at its meeting last Sunday. The first — which calls on Harvard to divest from the “fossil fuel industry” — won support from 71.5 percent of voters. That figure is virtually unchanged from 2012, the last time students voted on the issue. In that election, 72 percent of students voted in favor of fossil fuel divestment. James H. Coleman ’21, co-president of Harvard Undergraduates for Environmental Justice, which campaigned in support of this year’s referendum, called the results “encouraging,” especially in light of the 2012 vote. “That really shows that the student body still has a really strong sentiment for divesting from fossil fuels,” he said. Responding to the referendum, University spokesperson Melodie Jackson wrote in an emailed statement to The Crimson last week that Harvard would not change its investment strategy with respect to fossil fuels, but remained “committed” to tackling climate change in other ways. The second referendum on the ballot, which urged the University to divest from the “prison-industrial complex,” garnered 77.2 percent of the vote. Asked in October whether Harvard would consider divesting from prisons, University President Lawrence S. Bacow reiterated what his predecessor, Drew G. Faust, repeatedly stated throughout her tenure: the endowment is not the appropriate mechanism to effect social change. — Kevin R. Chen and Aurora E. Straus contributed reporting.